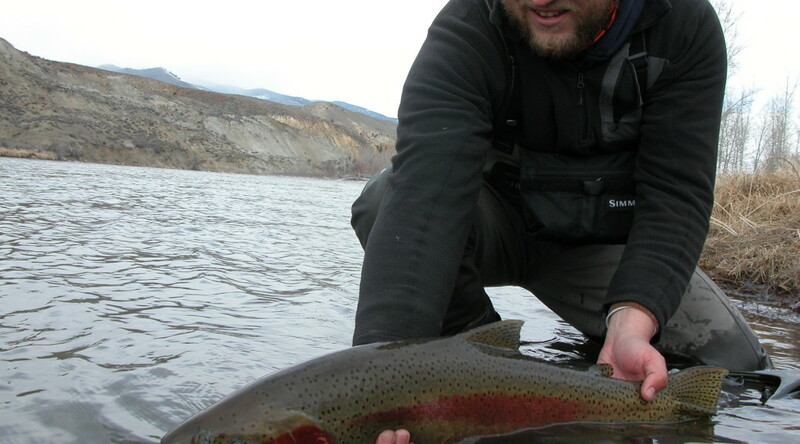 This has been a great year for us on the Steelhead rivers of Idaho, namely the Salmon. Just last season I could barely manage a bite on the swing, usually fishing too heavy and hanging up on every damn snag in the river. Losing confidence, I’d waste valuable time switching from swing to nymphs, and back again ten minutes later, then switch bugs to the point l I didn’t know what the hell to throw at them. Fortunately that’s all behind us now, whether we catch fish or not that day, because we finally have this swing thing pretty dialed in. Confidence, as with any fly fishing, is key. Bug choice is easy now-I pretty much fish one pattern- as well as being set to the right depth, which really isn’t as deep as I previously thought. Steelhead are predictable to a degree as to where they lie in the river, whether they bite or are even sitting there is the question. So you pretty much have to fish your arm off covering water, and especially good water, which is the never ending quest. So back to the river, our days start early and end late. We have runs in mind that we want to fish, most of these we’ve caught steelhead in, but many others just look good, so we give them a swing. Some of these runs are gargantuan, taking hours to cover, some are just little insides that have the look we want, and ten casts says it all. I can’t count the miles of water that have held nothing, but eventually you figure out your favorites by simply covering every square inch of likely looking water. Cast, step, cast, step, cast….tug!